You may know the man on that bottle by name, but to know the actual legend of Captain Henry Morgan is to know the privilege it is to be holding that glass. The man on that bottle was the Governor of Jamaica: a young 17th Century Welshman who set out for the West Indies and changed the landscape of the Caribbean and the New World. His unwavering ambition and leadership took him to every port-of-call, writing a legend, and reputation, that would precede him the rest of his days. He was, simply, the most legendary pirate to ever sail the seas. A distinction that earned him not just a lifetime of loyal crew by his side, but also the title of Sir Henry Morgan and Governor of Jamaica. 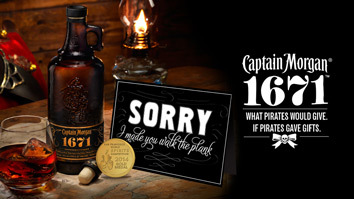 It is the legend and character of this man on which the famous Captain Morgan Rum Company is built.